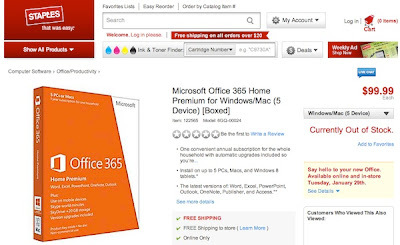 I just found this on the Staples website while searching for "mac office". Looks like we can expect the new Office 365 subscription service to go live in the very near future. Below are the product details taken from the Staples website. You'll get more done when you can work from anywhere with Microsoft Office 365 Home Premium for Windows/Mac. Office 365 has the latest version of all the Office applications you know and love, plus cloud services so you can have Office when and where you need it. Just sign in and you can get to your Office files, applications, and settings from virtually anywhere. Office 365 is an annual subscription. Microsoft and your Office retailer will let you know when it’s time to renew. • One convenient annual subscription for the whole household with automatic upgrades included so you’re always up to date with the latest features and services. You'll get more done when you can work from anywhere with Microsoft Office 365 Home Premium for Windows/Mac. All of your favorite Office programs are available for immediate access whenever and wherever you need them, and all of your settings stay stored in the cloud so that you don't have to alter your preferences every time you log on. Whether you're sharing a grocery list with family members or working on a project that needs input from coworkers across the country, convenient sharing tools will help keep everyone on the same page. Use streaming full versions of Word, Excel, Access, PowerPoint, Outlook, OneNote, and Publisher to create the presentation or document you envision on up to five PCs or Macs. New templates, including wide-screen documents and new PowerPoint themes, give you more options than ever before. You can also edit PDFs, embed videos, analyze data, and add photos and links to your projects. Because all your work is stored in the cloud, you can sign into your account from anywhere and get instant access to your documents and files. You can also share your files with others and easily view any changes that are made, so collaboration is simple. Use OneNote to store clips, links, and anything else you come across so you can incorporate these items into future projects. -Be more productive with a full version of Office, no matter where you are. -Each user can sign in to their Microsoft account to get to their documents, applications, and settings. -You’ll always have the latest features and services, thanks to automatic version upgrades. -Get all the latest email, scheduling, and task tools for the entire household. -Allow others to read and scroll through your Word docs in real time through a browser, even if they don’t have Word. -Incorporate content from PDFs into Word documents quickly and easily. -Add pictures, videos, or online media to your Word documents with a simple drag and drop. -Create more visually compelling presentations with widescreen themes in PowerPoint. -Find meaning in numbers faster with the Quick Analysis and Chart Animations in Excel. -One convenient annual subscription for the whole household with automatic upgrades included so you’re always up to date with the latest features and services. *Windows 7, Windows 8 OS, Windows Phone 7.5, Mac OS X version 10.5.8 required. Additional devices will be added in the future. Internet connection required. Internet and mobile telephone usage charges may apply. **Access and Publisher available on PC only. OneNote not available on Mac OS. ***PC running Windows 7 or 8 and Internet connection required. ****See office.com/information for details. Skype account required. Excludes special, premium, and non-geographic numbers. Calls to mobile phones are for select countries only. Skype available only in select countries. *****Internet and/or carrier network connectivity required; charges may apply.